What's so special about the #Vancouver Special? The Vancouver special is a bit like that relative that you all quietly say….” how did he end up in our Swedish family?” You have 50 cousins all with blond hair and names like Bjorn, Gustaf, and Helga and then there’s Cousin Jimmy, the only one with black hair, a weird sense of humor and well …the name Jimmy in a family full of Nordic names. He’s family and you know it, but he’s just a bit out of sync., from the rest of you, and that is how I would describe the Vancouver Special-- a bit out of sync. but very familiar. This week I was walking down a beautiful street in Kerrisdale…the sun was shining…the cherry blossoms budding. Birds were singing harmonies almost in step with my stride as I enjoy the breathtaking architecture and sweet aromas of spring, and then ‘wham’ I’m hit with it. No, I do not mean the smell of the horse %#** wafting up the hill from Southlands. Like a sudden kink in my back after walking up numerous stairs to get to post boxes (to hand out my market snapshots in case you are wondering) there it was…smack dab in the middle of rows of gorgeous heritage homes is the ubiquitous ‘Vancouver Special’. Almost as sudden as my instant displeasure at seeing the out of place home, I was hit for a brief moment with a sense of excitement and this is where the alluring part of my title comes into play. This Vancouver special was calling out to me…almost beckoning me. Telling me why I should give it a second look, why it is the preverbal diamond in the rough—giving me reason to consider why it is truly ‘special’ among this street of dreams. I knew what that ‘special’ meant…for in that instant the Vancouver Special once thought by me as the ugly duckling of Vancouver home architecture styles had redeemed itself entirely as I looked up from my feet only to realize that I wouldn’t have to climb a flight of stairs. Its mailbox was at ground level and this is where my view of the Vancouver Special changed. After handing out flyers to heritage homes some with 10 flights of stairs, the Vancouver Special took on new alluring appeal to me. I suddenly liked them! It’s that same feeling you get when you are not sure you like someone but then they do something to change your opinion of them and instantly you see them different. We can all probably agree that name ‘Vancouver Special’ is a bit of an oxymoron when you look at its design aesthetic. It’s not special because it looks good. It’s got to be special for some other reason right? The Merriam-Webster dictionary describes the word special as “different from what is normal or usual." Ok let’s take a look at what that 'Special' might be, starting first with the Vancouver Special Wiki page where you will see it described in terms of proliferation and mass production. This doesn’t exactly sound ‘special’ to me, rather more overwhelming if anything. The Vancouver Special is everywhere. In fact so much so that the city of Vancouver realizing that too many ‘specials’ were being made decided to implement a little family planning by making changes to the single family zoning regulations in the 80’s with the intent to stop additional Vancouver specials from being built but not before over 10,000 Specials propagated the Vancouver landscape between the period of 1965 to 1985—and that is just in Vancouver. Take a trip across the river and you will see that the 'Special', just like morning glory, sprung up in other parts of the Lower Mainland taking over entire streets, growing like a weed that you can’t quite control. I don't think there are any statistics on the number of 'specials' outside of Vancouver but I would venture a guess that there are upwards of 30 thousand or more when you factor in Burnaby, Delta, Langley and other Lower Mainland suburbs. When my wife and I have looked for homes ourselves she points them out, dismissing better looking homes as possible contenders for purchase…honey don’t you think that would be a great home to raise the kids—its spacious, functional, and reminds me of my childhood? I won’t tell you what I think of when she says that but then again, I grew up with monkey’s in my backyard before I moved to Canada so I really have no fair comparisons. So like my friend, I allow my wife to live under the allusion that the Vancouver Special is a beautiful architectural marvel. She grew up in a Vancouver Special and all memories are wrapped up in it. The Vancouver Special is a cookie cutter home so she is virtually going back to her childhood every time she steps in one much less looks at one. The Vancouver Special is unique to the Vancouver landscape and is truly a part of the Vancouver Psyche now but not because of the shier volume of them, rather I think the 'special' is a reminder of a time when Vancouver was not the most expensive city in North America. The Vancouver Special symbolizes a time when everyone had a chance at making it here. 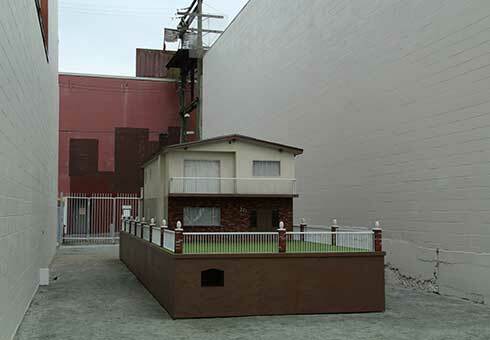 A view not lost on Artist Ken Lum who built a miniature version of the 'special' as a commentary on the city's cost of living. 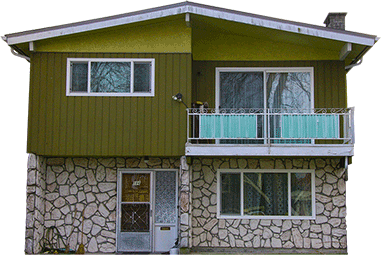 Ken built a Vancouver Special scaled to its property value in 1973, then increased it by 8 fold. What you get is virtually a backyard playhouse. My father-in-law actually built a Vancouver Special in 1970, it was his first home. 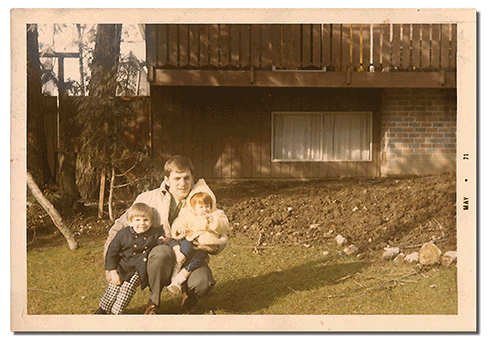 For a guy like my father-in-law who had come from a home that didn't have much money, the Vancouver Special afforded him the chance to build on his dreams. In fact, he talked about his Vancouver Special as a source of pride, but not so much in how the house looked but in how he got the plans for next to nothing, that it was fast to build, spacious, affordable and its box like shape allowed for a degree of customization by him later on. In fact his second house was built in the ‘Salt Box’ style for many of the same reasons. By and large it is not known as a pretty house, it’s a functional one that sheltered thousands of young families including new immigrants, like my family, who came to Vancouver during its building boom years. The Vancouver Special was easy to build fast and on demand. Some even went from empty lot to ‘finished home’ in just three weeks. It also maximized the use of space on the standard 10-metre lot so it was great for multi-generational families that needed more living space. The plans were easy to get and only cost $65 from the local planning office, making it a home that was inexpensive and very convenient. The Vancouver Special was in the 70’s what the condo is today to Vancouverites, an affordable entry level home for first time home owners. You can’t build them anymore in Vancouver and it has long served it’s original purpose as a mass produced entry level home. It has though gotten its second wind of late, calling out to a new generation of Vancouverites to use it again by renovating it to give it an updated appearance. Out with the stucco, metal framed balcony and aluminum window frames. In with timber beams, spot lighting, modern finishing and brightly coloured doors. 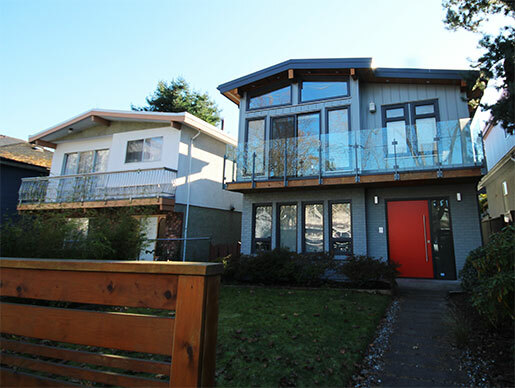 What was once an affordable cookie-cutter home has now reoriented itself for the next generation to use it once again as an entry way into the housing market, and that my friends puts the ‘special’ in the Vancouver Special!